Nandina domestica, also known as the Japanese Sacred Bamboo and Heavenly Bamboo is a much used low growing shrub . Wholesale nurseries offer an excellent range of these low maintenance low growing border or hedging plants. The foliage reminds us of bamboo however this is not a bamboo at all. 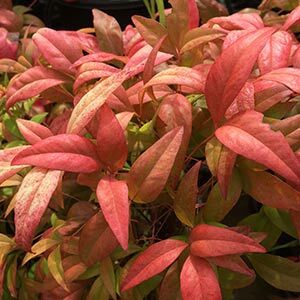 New foliage is an attractive red turning to green with a red tinge. Red berries in autumn are an added attraction. Growing well in full sun to part shade the species will grow to around 1.5m. Lower growing cultivars include ‘Gulf Stream’ and Nandina domestic ‘Nana’ the smallest reaching around 60cm. Over recent year a number of new cultivars have been released. A range of heights, foliage colours and other characteristics which provide the landscaper with a broad range of choices for a range of uses. It is the dwarf cultivars that are the most popular. All varieties are versatile in application, being regarded as having the following characteristics. N. domestica is commonly called Japanese Sacred Bamboo. N. domestica ‘Gulf Stream’ is a new cultivar from the USA growing to 50cm. Nandina varieties are available for sale from the following wholesale growers and nurseries.